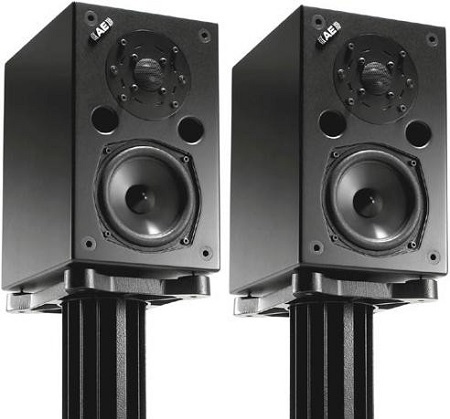 If you have ever looked at speaker feet, you may have seen the odd arrangement which seems like it is made out of two different parts that are put together. While this is a simplistic way of looking at it, in essence, this is exactly what speaker stand spikes boil down to. These speaker spikes will be our subject for today. It will be difficult to understand the proper use of speaker stands if you don’t understand the spikes that are integral to their use. There are different types of speaker spike pads, all of which are designed for use in certain situations, so we are going to take a detailed look at them and their differences. 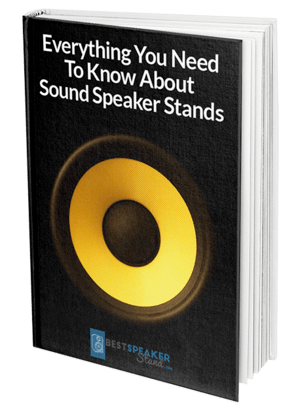 Before we get into the details about the importance of speaker stand spikes and their applications, we are going to take a look at the basics behind them, including why you need them in the first place. As you may have guessed from the name, speaker spikes are fashioned in the shape of spikes. Not quite like the spikes that you would imagine on medieval weapons, but not too far off, either. These spikes are slightly more rounded, and they tend to be rather wide, though they still taper to a very narrow point. What speaker spikes do is mostly work as feet for your speaker or your speaker stand. While some speakers will be able to have their spikes screwed directly into the cabinet, this is sometimes not the recommended course of action, as it will not sufficiently isolate the vibrations. Most speaker spikes are instead screwed into the bottom of speaker stand, which is usually coupled to the speaker. The second half of speaker isolation spikes is the pad on which they sit. While the pad is not entirely necessary, you will find that it keeps your speaker stand in place during particularly heavy use and it also ensures that your floor is not damaged. The primary use for speaker stand spikes is that they allow you to couple and decouple your speakers at the same time. Those of you who are newer to the domain of sound may be wondering what it means to couple or decouple your speakers; we will give a short overview of the physics at play. When your speaker is playing, it creates forward and rearward movement. When the driver of your speaker moves forward, something needs to be pushed back to create an equal and opposite reaction to comply with the laws of physics. While your speaker may not necessarily move back when it is playing, this does not mean that it doesn't try to. Since the speaker itself is usually too heavy or too well anchored to move backward just from the force of it playing, it will instead remain in place, but it will vibrate. These vibrations which emanate from your speaker can disrupt the intended vibrations which are caused by the driver playing your music. These internal vibrations are not the only issue that you will have to worry about. Your speaker will also be affected by the vibrations of your home or whatever it is that your speaker is sitting on. While coupling or decoupling your speaker can be accomplished in different ways, you will find that there are few better options than a good set of spikes. Spikes help keep your speakers coupled in the way that you want them to be and decoupled at the same time. Coupling is responsible for diminishing the internal vibrations of your speaker and decoupling will help prevent the vibrations which come from the exterior environment. The spike is made of a different material from your speakers and speaker cabinets, so you will find that it helps isolate vibrations in both directions. The pad of your spike will isolate vibrations that are beginning in the surrounding environment, such as from the floor. On the other hand, the spike itself will help ensure that vibrations from the cabinet and the speaker itself will be diminished by the higher mass of the floor. This helps ensure that you have the best audio quality, as it will remain clear and uncorrupted due to vibrations. The other reason that you will want to employ speaker spikes is to ensure that your speakers remain stable. Most speaker spikes can be adjusted to make sure that your speaker will remain positioned on each one of the spikes at the same time. Especially when you are positioning your speaker on an unstable surface such as a carpet, you will find that you will need to make use of spikes. In fact, there is a particular type of speaker spike which is made to work in these situations; they are known as speaker stand carpet spikes. These spikes can often be positioned on the underside of speakers which are meant to accommodate them. While these spikes are simple, you will find that they have a few drawbacks when compared to other types of spikes. Regardless of their issues, you will find that standard speaker spikes are ideal for those who want a quick and cheap solution for keeping their speakers off the ground. These spikes are meant to be used with speaker stands instead of the speakers themselves. You will find that these spikes can often come included with your speaker stands, as there is no better choice of feet for them. Speaker spikes and speaker stand spikes are a crucial part of ensuring that you get the best possible audio experience. We hope that our guide has helped you understand this subject better and we wish you luck in your purchase.